Learning disability charity Hft has opened an environmentally-friendly car cleaning service in Gloucester that gives people with learning disabilities the chance to learn new skills in paid employment. Future Clean is a social franchise purchased by Hft at Robinswood Country Park in Gloucestershire and will complement the charity's flagship service in Stroud. Both sites will employ 10 people with learning and physical disabilities. Hft supported employment coordinator, Alan Pope, said: "Currently less than 10% of people with a learning disability have a job. Supported employment opportunities, such as Future Clean, give people with learning disabilities more opportunities to develop their skills and earn an income. It’s also offers a chance to meet new people, build self-esteem and be involved in the community. "We are delighted to be expanding our services in Gloucester to empower more individuals with the necessary skills and confidence to be able to move onto further employment." The project uses an industry accredited eco-friendly and portable commercial car valeting system. The green car washing process ensures no water or chemicals reach the floor, dispensing with drainage concerns. It also uses harvested and filtered rainwater to further boost its eco-credentials. Alongside the new car cleaning service, Gloucestershire Gateway Trust is opening a café employing people with a disability at Robinswood Country Park. Councillor Kathy Williams, Gloucestershire County Council cabinet member for long term care, said: "It is great to see Future Clean branching out into Gloucester, offering more people with learning disabilities jobs and bringing their fantastic car washing services to Robinswood Hill. 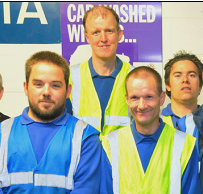 Future Clean is growing from strength to strength whilst helping people with learning disabilities in Gloucestershire develop their employability skills." Future Clean franchises have been sold across the country with the aim of helping people with disabilities and other disadvantages into work nationwide.